The internationally recognized Ainsworth Attachment Clinic provides evidence-based evaluations, professional trainings, intervention planning and consultation. We serve in situations of parental separation, trauma, adoption, foster care, chronic illness, and CPS concerns. 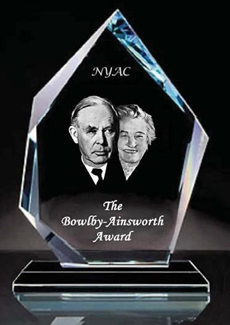 Dr. Robert Marvin is co-recipient of the 2013 Bowlby-Ainswortth Award for developing the Circle of Security intervention and making it widely available for clinical research and interventions. The Circle of Security® is an innovative intervention program designed to improve the developmental pathway of children and their parents. Robert Marvin, at the University of Virginia in Charlottesville, and Glen Cooper, Kent Hoffman, and Bert Powell from Marycliff Institute in Spokane, Washington were the originators of this unique, evidence-based, award-winning program. 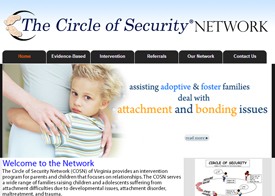 The Circle of Security Network associated with the Ainsworth Attachment Clinic provides the evidenced-based Circle of Security Intervention Protocol in Virginia. Portsmouth I November 9th I Dr. Marviscreened and discussed The Dark Matter of Love at the Virginia Juvenile Justice Association Fall Seminar | Explore. Norfolk | August 24th |Unlocking the Mystery - Children in Foster Care | Explore.. The Ainsworth Attachment Clinic and The Circle of Security ® 2013-2018. All Rights Reserved.